Ancient Nechung Rituals of Tibetan Buddhism History ! 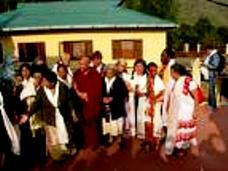 Prophecy Ceremony of Dalai Lama In Exile , Dharamsala ! The phenomena of the State Oracle remains an important tradition in the tibetan way of life. The prime fuction of an oracle is not just for making predictions but to protect the Buddha Dharma and its practitioners. In the Tibetan tradition, the word oracle is used for a spirit which enters those men and women who act as mediums between the natural and the spiritual realms. The mediums are, therefore, known as kuten, which literally means, "the physical basis." In todays tradition of Tibetan Buddhism the 'Nechung' is the principal oracle who will protect the State of the Tibetan Government and His Holiness the Dalai Lama..the chosen Bodhisattva. Following this Ancient tradition in Tibetan Buddhism History.. In his autobiography 'Freedom in Exile', His Holiness the Dalai has said..
" This four hundred years old tradition is practised every Tibetan New Year - Losar, where I consult the 'Nechung'. Other than that he can be consulted for any other queries. I like to follow this system since this wisdom of the spiritual world has helped me and many times the answers have come true." Memoirs of a Caring Nechung in Tibetan Buddhism History.. According to the Nechung tradition the Nechung dorjee has to bow before the Dalai Lama, however His Holiness has fond memories of Him as a good friend and a caring elder. " If he noticed that I had dressed carelessly he would come and arrange my robe". 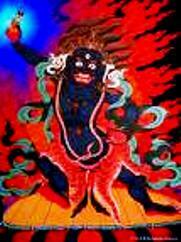 It is not easy to deal with the Nechung as it takes time and patience during each question for Him to open up. He is like an austere old man dressed elaborately and only answers questions concerning major issues so has to be asked accordingly. Nechung Monastery..in Tibetan Buddhism History.. The Nechung Dorjee has its on monastery. Mostly he goes to the Dalai Lama for any formal occasion. He is dressed in his traditional finery consisting of several layers of clothing, topped by a highly ornate robe of gold and silk brocade. This covered with ancient designs of red, blue, green and yellow. On his chest he wears a circular mirror studded with amethyst and turquoise and with the sanskrit mantra corresponding to 'Dorjee Drakden'. This whole outfit weighs more than 70 pounds and when in trance he can hardly walk in it. 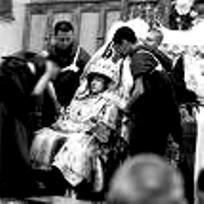 The Ceremony..in Tibetan Buddhism History..
Now the kuten's face transforms, becoming rather wild before puffing up to give him an altogether strange appearance, with bulging eyes and swollen cheeks. His breathing begins to shorten and he starts to hiss violently. Next, he leaps up with a start and, grabbing a ritual sword from one of his attendants, begins to dance with slow, dignified, yet somehow menacing, steps. He then comes in front of the Dalai Lama and either prostrates fully or bows deeply from the waist. There follows an interchange between Nechung and the Dalai Lama, where he makes ritual offerings to him. His Holiness then ask any personal questions he has for him. After replying, The Dorjee spirit returns to his stool and listens to questions put by members of the Government. He looks like a magnificent, fierce Tibetan warrior chieftain of old. As soon as Dorjee Drakden has finished speaking, the Kuten makes a final offering before collapsing, a rigid and lifeless form, signifying the end of the possession." The Nechung Dorje Monastery was made in 1985 in Dharamsala. "We built the monastery slowly, step by step," says the 72-year-old Venerable Thubten Phuntsok, one of the key players in the reconstruction of Nechung monastery, and as the holder of the Vajra Acharya (Lopon) title, is the highest ranking monk after Nechung Kuten and Nechung Rinpoche. The monastery has 61 junior and senior monks, including five monks from the parent Nechung monastery who escaped Tibet in 1991. The daily schedule of the monks begins at 5:30 a.m. and ends at 9:45 p.m. Apart from daily prayer sessions, their study course include Buddhist philosophy, debate, training in chanting, preparation of ritual cakes and mandala creation, memorisation of religious texts and classes in Tibetan literature and English. The monks also study various subjects of Buddhist sutra and tantra of both the Ancient and New traditions. The Nechung Monastery is now a well established institution for the future monks to learn the ancient rituals and traditions. For More On Tibetan Buddhism History Go to Dalai Lama ,Dharma!